It’s almost cliché for a hotel to exalt its connection to its surroundings, no matter how true — or evident — that may actually be. Yet at Canopy by Hilton Reykjavik City Centre, the claim can be taken seriously. 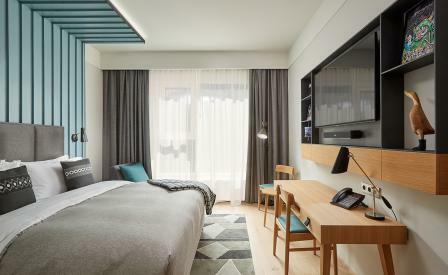 From drinking water naturally filtered by Icelandic lava, to in-room music boxes that play Icelandic lullabies, there’s no mistaking that this abode lies in the heart of Reykjavik. Welcomed with a locally inspired keepsake at check-in, guests are introduced to a space that is both wholly Icelandic and in-line with the newly developed Canopy by Hilton brand’s adventurous aesthetic. Guest rooms pull off a uniquely Nordic feat — interiors that successfully amalgamate warmth and comfort with crisp, functional design, here livened by the icy hues of ocean blue and grey volcanic rock. Meanwhile, locally-inspired artwork and textiles play second fiddle to views of the sea and mountains, which paint an unrivalled backdrop. The theme continues at the playful Geiri Smart restaurant, where head chef Jóhannes Steinn Jóhannesson’s ever-changing menu is led by the offerings of local farmers and fishermen. Similarly, an on-site coffee shop and a bistro offer a taste of the city so authentic that actually stepping out of Canopy becomes an afterthought.